The secret to running better meetings is to run meetings better. The secret to running meetings better is to fully engage the participants. And the secret to engaging them is to "get into their thinking." Not long ago I asked Jack, one of my CEO coaching clients, "How often do you use the word 'goals' in a meeting?" Jack replied, "At almost all meetings." "Really," I said bemused, "and when you say it, how often do they start salivating and jump all over the word as if they can't wait to sink their teeth into it?" Jack laughed, "What are you kidding? I think they barely tolerate it and I think a few are checking their email sneakily under the table." "What do you do next?" I asked. "I raise my voice and tell them to pay attention," he said. "How does that work out? Does it really grab and hold their attention?" I asked. "They get more alert, but I don't know how engaged they are," he explained. "You might want to get into the way they listen," I replied. "What do you mean?" Jack asked. "Everyone has a preferred way of listening. Only 5 - 10 % listen forward, which is called a 'forward cognitive bias.' Those are the CEO's or Founders of companies and organizations that fully get what the word 'goal' means and can tell you without missing a beat what it is for them and their organization. The remaining 90 - 95 % have trouble listening forward and instead wait for things to happen and then react to them. That's called a 'reverse cognitive bias,'" I explained. I conrtinued, "To give you an example of what I'm talking about, do you ever have trouble picking out where to eat with your wife?" He laughed again, "More often than not and when it happens, it ruins my appetite." "That's because with that conversation your wife and you are not able to think into the future. But I'll bet after you go, you both are very clear about whether you liked the place or thought it was a dive," I said. "You're right. That happens every time," he affirmed. "Well that's what happens in a meeting with your people and why when you bring up the word, 'goal,' they seem a bit bewildered. That's why you're the CEO and they're not," I said. "So what do I do?" he asked. I explained, "Get into their style of listening by saying to them at the beginning of meetings, 'I'd like you to each imagine that it's 60 minutes from now and we're all going back to our offices or to other things we need to do and when that happens each of you think, 'That was the best meeting we have had in months.' Here are index cards and I want each of you briefly to write down what happens by the end of the meeting and in the meeting that causes you to think that at the end. And do it anonymously." "Then hand out the cards and have them answer that question," I added. "By doing that, you have aligned with their style of thinking a la reverse cognitive bias. Make sense?" "Yes it does," Jack said looking intrigued by the process. "Oh one other thing Jack," I said. "Don't use the word, 'goal,' anymore. People who think in reverse think of that word as if you're throwing a dart into the future, built on a wing and a prayer and they also think, 'what the heck happened with last year's 'goals?'" I added. "Instead, substitute the word, 'outcome.' Most people know that outcomes are preceded by actions. Good outcomes by effective action; bad outcomes by ineffective action," I explained. "So in the exercise you might want to have them write down what outcome occurs at the end of the meeting so that they say it was one of the best meetings in months and then what happens in the meeting that results in that outcome." 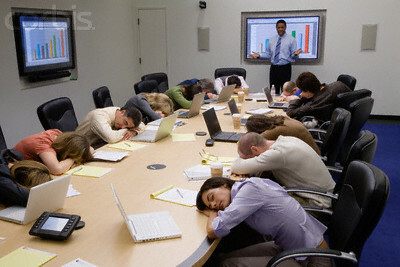 When you run meetings, how often are your participants fully engaged? If they're not, don't get frustrated with them and expect them to get into your forward cognitive bias way of thinking (which they can't do). Instead align with how they listen in reverse and you might just get them to be willing and able to move forward more effectively. Watch a full 12 minute keynote video entitled: "Change Your Thinking Forever in 8 Minutes" that covers the above concept and also check out: Seven Words Your Regular Employees Can't Stand. BTW this is an example of heartfelt leadership in running meetings. Why? Because by aligning with your people to help them learn and grasp what they need to succeed, you are showing more caring about helping them learn than pushing them to obey you. Give this a try at your next meeting and get back to us about how it worked for you. This is just a single example of many tools we have at Heartfelt Leadership for being a hearfelt leader or manager and if you are interested in hearing more, please contact us at: info@hfleader.com.